Learn an authentic and complete Chinese martial art? If you answered “yes” to any of the above questions, then Kung Fu Schools can help! 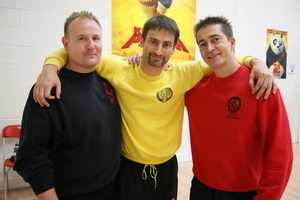 Kung Fu Schools is the largest professional martial arts organization teaching authentic Wing Chun Kung Fu in London. Wing Chun is an ancient martial art form that with effective applications in the modern world. Apart from being a complete system of self-defence, Wing Chun can also help with improving your overall health, be it physical, mental and emotional. With 3,500 square feet of professional training premises, free parking, and a close proximity to mainline stations and buses, Kung Fu Schools is easily accessible from Croydon, London and Surrey. Our Adults classes are tailored for anyone aged 13 and above, with a comprehensive curriculum and a fully structured grading system. Classes are taught in a relaxed and friendly atmosphere, with a healthy mix of students of all ages, male and female, from different walks of life. Our instructors are professional, friendly and approachable, and they attend regular meetings and training seminars of their own to ensure they impart the best possible brand of martial arts to their students. For added peace of mind, they are all CRB-checked, with instructor indemnity insurance. Whatever you hope to achieve in our martial arts programme, Kung Fu Schools can cater to your needs. We offer a range of different training opportunities, up to our Career Instructor Training programme for those who would like to pursue a career as a martial arts instructor. Whether you’re looking for an effective self-defence form, a fun way to get fit, or to pick up a new hobby, we can help you achieve your goals. So why not book yourself in for our free, no-obligation trial lessons? You get to try 4 free classes over two weeks to see if Wing Chun is for you. These trial lessons are by appointment only, so book yours now!